This iPhone 3GS was my first ever iPhone. It has not been used in a while and was just sitting on a shelf doing nothing. Today when I looked at it I noticed it had popped open, and it was apparent what had happened. 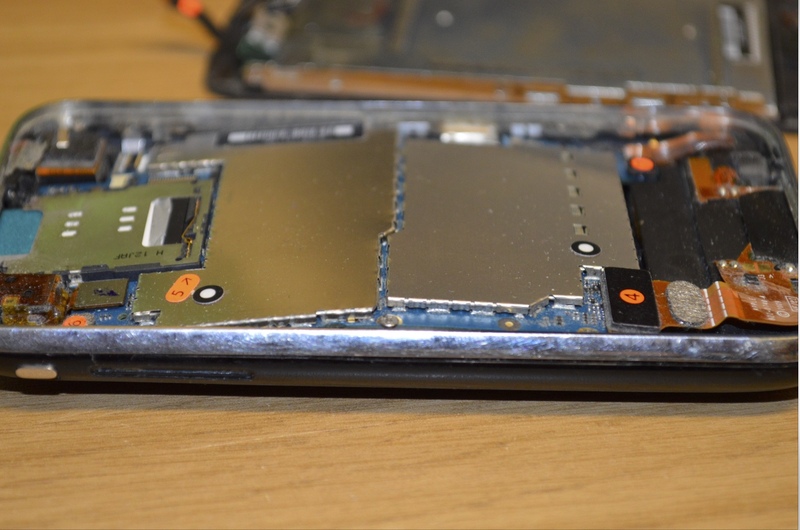 The battery inside the phone had gone faulty, and ballooned up causing it to expand to the state where it could no longer be contained inside the phone and the phone popped open. On closer inspection, I can see that the main circuit board in the phone has bent, and the plastic clip at the top of the screen has given way, allowing the phone to pop open, destroying itself in the process. I disassembled the phone and you can see from the pictures the extent of the damage. You can see in this image, how the circuit board is bent. What you can’t quite make out, due to the narrow focus is that when the board bent it actually wrenched it’s mounting screws right out of the case, complete with their brass mounts. They have been ripped right out of the back housing. This is rather a serious issue actually, lithium batteries are extremely potent. 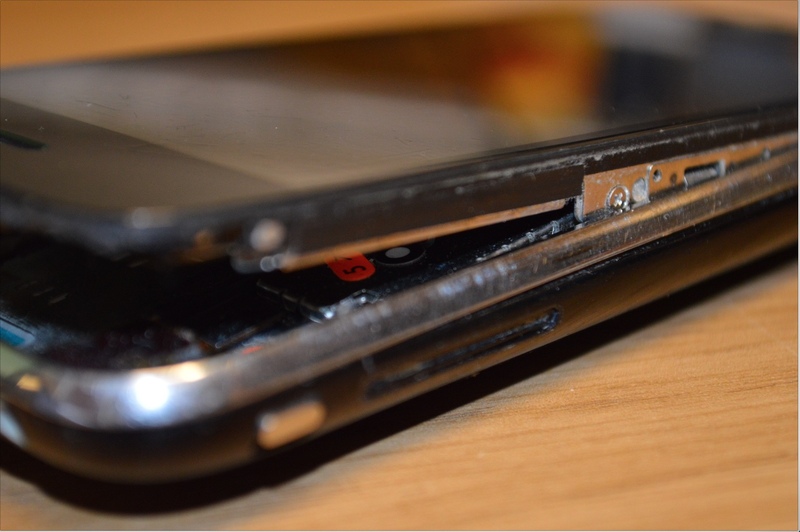 The internet is awash with stories of what can happen when Lithium batteries go bad. 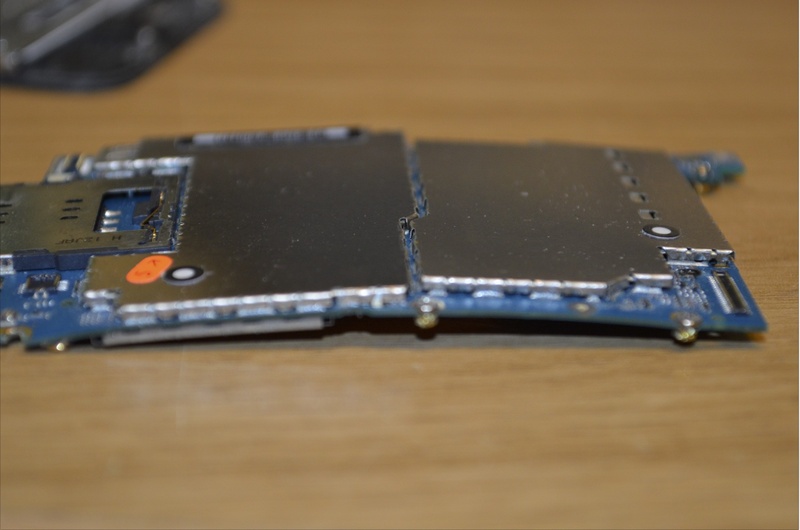 Try a simple google search for “exploding iphone battery” if you want to see some. This phone had a genuine factory fitted Apple battery inside, not a cheap replacement from some barrow stall in a shopping mall. In my case, the battery had gassed-out, and although it destroyed the phone, the toxic gases were all completely contained within it’s sealed safety bag, as it’s designed to do, and it did not catch fire. Would you trust a cheap replacement battery to behave so well in similar circumstances? Finally, some food for thought. Do you have old smartphones, or tablet devices that you no longer use, lying around in drawers, or gathering dust on a shelf? Maybe you should consider disposing of them properly, before their batteries decide to self destruct, possibly going on fire in the process. It can, and does happen. Take the Phishing Test 2016: An interesting year.